You should also add in a short name of your product to add your personal touch to it and help it stand out. I name all my items. Which would would you click on? Naming your items distinguishes it from others similar to it. Keep the name short though, preferably one word. This is where a lot of people can make simple mistakes. I certainly have! Here’s the key: Use thorough descriptions, include important information, and lots of paragraph breaks. My first paragraph is a short and interesting description of my product that appeals to the emotional side of my customer. I try to paint a picture of my product that helps the customer imagine they already own it and are holding it, touching it. Use sensory imagery if you can. You will lose customers by having huge paragraphs, and they may miss out on pertinent information. Back in July, I had one lady purchase a quilt without ever emailing me first (most people talk to me first.) I wrote her afterwards and explained to her when the quilt would be ready. She wrote back and said she thought it was a Ready to Ship item and I ended up refunding her money. 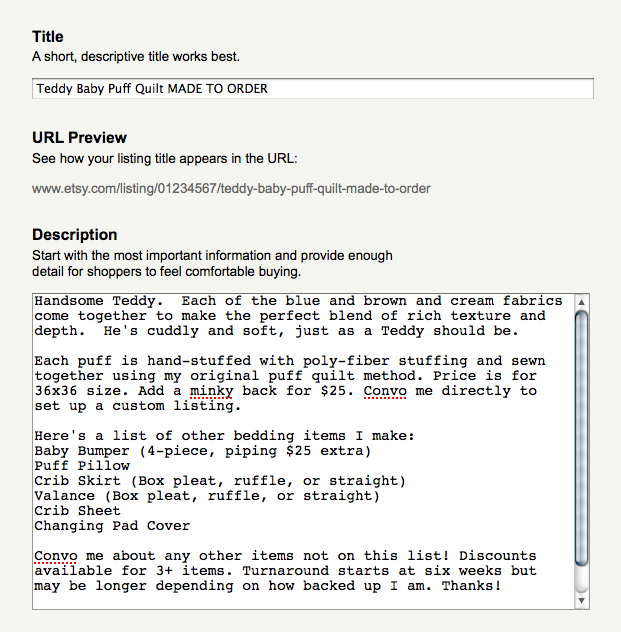 I hadn’t included ‘Made to Order” in the title, but rather in that huge paragraph in the description. She hadn’t read it all the way through and figured that out. 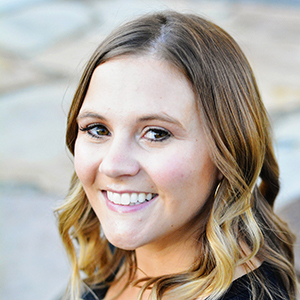 So make sure you list important information where it can clearly be seen: size, turnaround time, options, availability, washing instructions, etc. Tagging: You can read more about this here: Read Etsy’s Tagging Tips. Tags are how your potential customers find you through searches. You should use all 14 of your tags, and if you can’t think of other tags, get creative! You can even throw in your shop name sometimes. List colors, textures, even weird descriptive words. 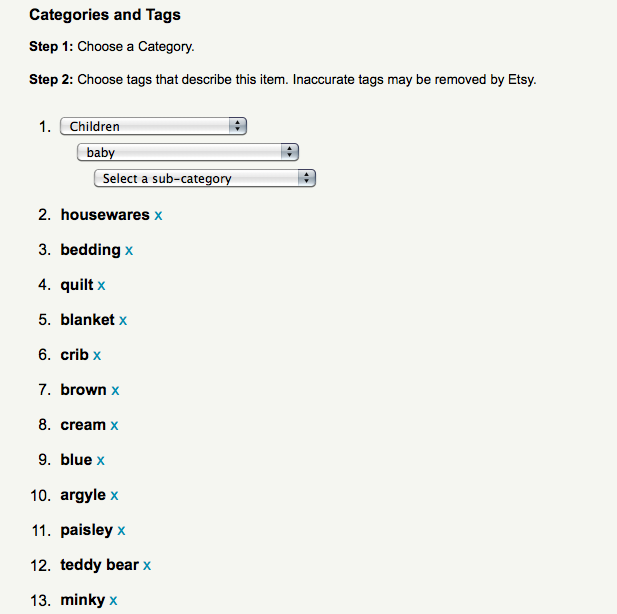 Basically just imagine that you are a customer searching Etsy…what would you type in the search bar? If an item is not getting many views you can always go and revamp the tags. Pricing: Pricing is actually a very debateable topic, but here’s one way to do it. That’s not set in stone, definitely. But you have to value the time that you put into making your product. However, sometimes the product takes a really long time to make and it’s not realistic to expect people to pay the price that equation would equal. (Like if it takes you 20 hours to knit a scarf, you can’t really expect people to pay you $250.) Don’t undersell yourself though and don’t try to beat Walmart’s prices. People come to Etsy for one-of-a-kind items and don’t necessarily care about low prices. Often people will assume that if a price is pretty low, the product quality is poor. 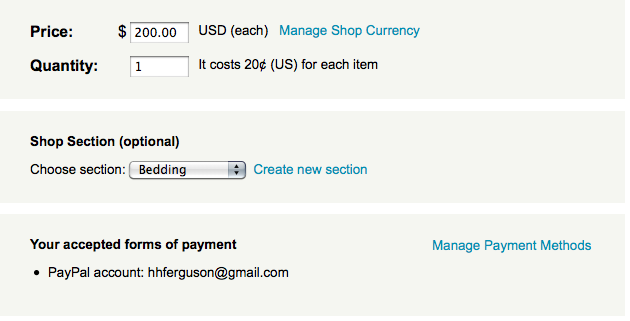 Also use this section to create shop sections and set up how you would like to be paid. 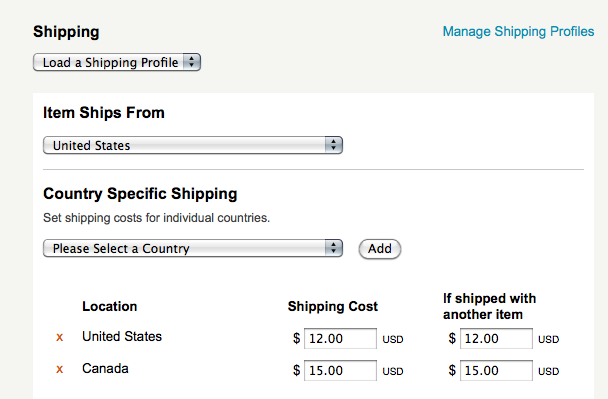 Shipping: You can set your shipping manually or you can go into the shipping link and create a ‘shipping profile.’ You name the profile (like ‘quilts.’) And then you list the shipping you want and then save the profile. 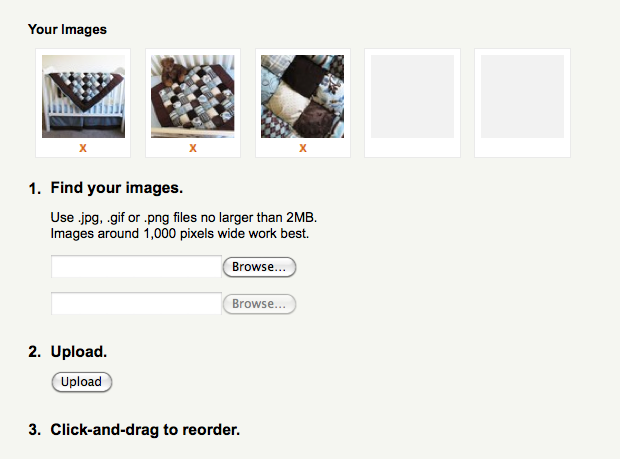 After that, you can just click on your ‘quilts’ shipping profile when you are listing an item, easy peasy. How I calculate shipping costs is after I ship the item after the first few times, (first time listing just use your best guess) I figure out roughly how much it costs to mail. I ship all my bedding through Fed Ex and I ship small items through USPS with Delivery Confirmation. You need to always have a way to track your package in case someone doesn’t receive their item and you can figure out where it is. For international shipping, I don’t charge through the listing but I get an estimate later and bill the customer before shipping. ALWAYS take pictures in natural light. Yes, even if that means you braving the harsh winter weather to go outside. That is ideal lighting (in the early evening, preferably in evenly shaded areas.) If you can’t go outside (like with my bedding sets) just make sure to have as much light as possible, near a window. Take off the flash. ‘Nuff said. If your camera has a macro setting (mine is a little flower symbol) put it on to capture close details. If you sell a clothing item, try to have someone model the clothes. People like to see what they look like being worn. And it’s easier for them to visualize them wearing it. If a product isn’t getting views, re-take your photos. Wow exciting to learn how to make an etsy shop. Thanks for teaching me! Thinkin Of Making A Shop…Your So Helpful…Oh Yea Got A ? Do U Gotta Report This On Taxes n What Not?? Jus Wonderin Nvr Done Anything Like This Before. Again, thank you so much for sharing what you have learned with us. It's time for me to seriously think of the business aspect of my crafting and recycling projects.